and telephone number, if appropriate. We'd love to hear from you. The Milds now live full time in Honolulu, Hawaii, where they have family including two daughters three granddaughters and two grandsons. We do travel quite a lot to family and mystery conventions such as Malice Domestic, Left Coast Crime, and occaisonally, Bouchercon. Autographed (and personally autographed) copies of Locks & Cream Cheese, Hot Grudge Sunday, Boston Scream Pie, Death Goes Postal, Death Takes A Mistress, Death Steal A Holy Book, Cry O'hana, The Misadventures of Slim O. Wittz, Soft Boiled Detective, Murder, Fantasy, and Weird Tales, Miriam's World—and Mine, and Love! Laugh! Panic! Life With My Mother, can be ordered at discount prices directly from authors, Rosemary and Larry Mild at this on-line site or via e-mail. All our books are available from Amazon.com, Barnes and Noble and can be ordered from local bookstores everywhere. Magic Island is where authors Rosemary and Larry Mild often find inspiration to write and market their books, short stories and essays. 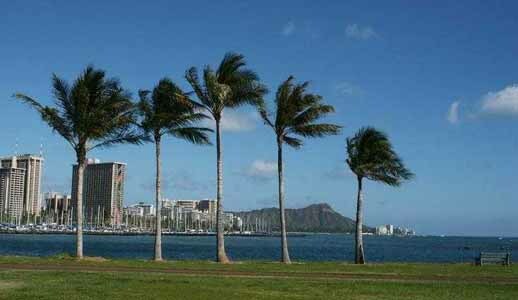 Located at the tip of Ala Moana Beach Park in Honolulu, its many walking paths unfold into sky, mountain and seascapes of dramatic proportions.